As the days grow shorter and the skies greyer here in Seattle, it marks the start of school, for me, a second year of graduate school, and the end of tourist season. I’ve learned to appreciate the wet darkness of winter in Seattle. It means days pass a little quieter in the strip of downtown I call home and Pike Place market becomes, again, a place to explore playfully- something that becomes a lot harder when the onslaught of tourists arrives in the fair weather months. 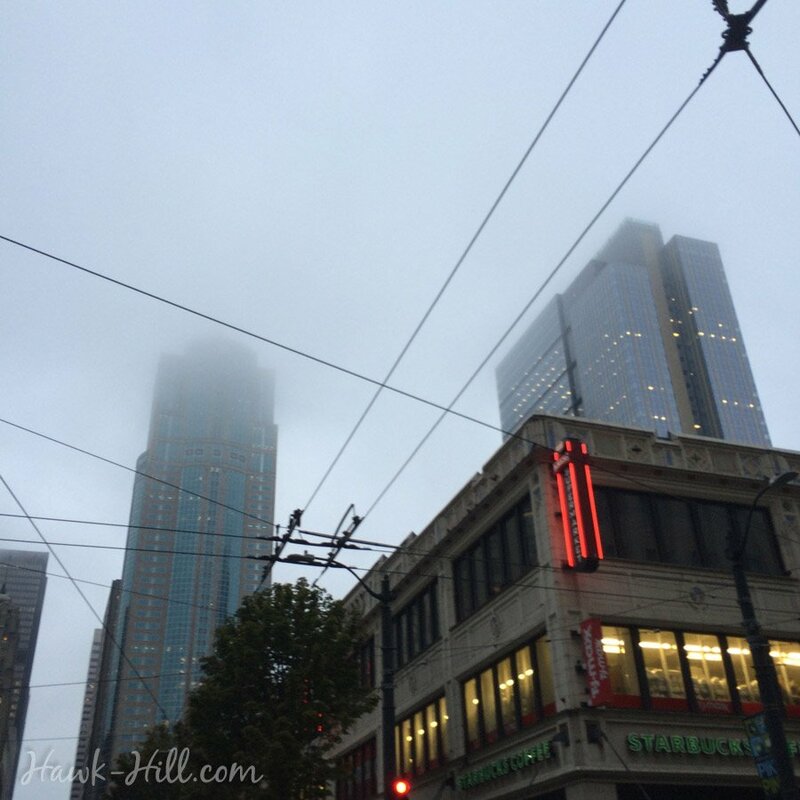 When I moved to downtown Seattle in January of 2016, I began a ritual of Thursday exploration in the market. In a school where classes run Monday through Wednesday, Thursday became my Saturday, a day to rest, reset, go to therapy, and revive myself a bit before jumping back into Friday & Sunday homework days and Saturday play. In this rhythm I adopted Market Thursdays- in which I try something new at Pike Place each Thursday. As this school year begins and I’ve vowed not to neglect my blog this year, I’m going to be posting at least semi-regularly about my reviews of adventures in the restaurants, groceries, and market stalls at Pike Place. This Thursday I set out for the market set on acquiring some Black Eyed Susans before the chill temperatures and grey days spell their departure from Pike Place Flower Market until late summer next year. Black Eyed Susans (and their more expensive cousins, Sunflowers) remind me of home in all the best ways: endless gravel roads between oceans of gold wheat fields, outlined with orange and yellow Black Eyed Susans lining the sides of the road like runway lights. I always keep an eye out for Black Eyed Susans because, unlike more delicate flowers, these fierce little weeds of my home state last for days or weeks in a vase in my apartment- making them perfect for my grad school budget. 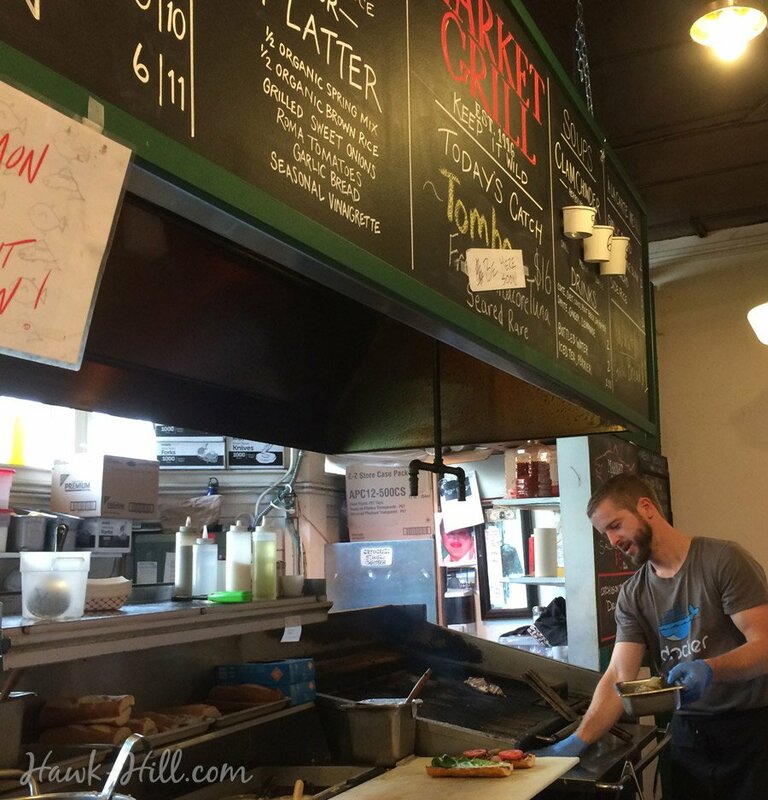 A friend had been telling me recently about the unassuming Market Grill and their fish sandwiches. I’d walked past this place no less than 100 times, I’m sure, and though noticing the tiny counter, exposed kitchen, and 10 coveted seats, I’d never stopped to try any of their offerings. Feeling brave, when I stepped up to place my order I simply asked the man behind the counter what he recommended for my first time there. “Halibut, no question” was his reply, so halibut I ordered, as I took a seat at the counter and watched as much lunch was prepared just a few feet in front of me. 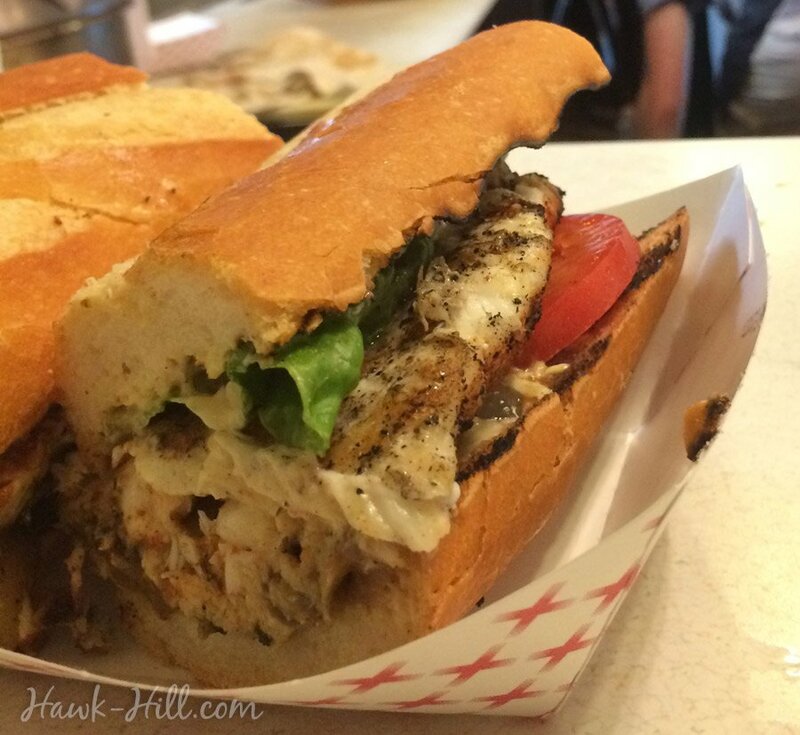 Fresh wild caught fish and french bread from the bakery on the other side of Pike Place market are key ingredients, but to say that’s all would be an understatement. My sandwich came unassuming, a grilled halibut fillet on a baguette served in a carnival-style hot dog tray. But you guys. You guys… Best. Fish Sandwich. Ever. Maybe the best sandwich ever. I don’t know what is in the secret sauce. Or how they get their onions caramelized so perfectly. Or how halibut and onion and tomato and lettuce actually form such a perfect combo, but this fish-suspicious eater was impressed. Market Grill’s tagline claims their fish is always fresh and wild caught, and I believe it. I loved this fish sandwich. And, important to note, I HATE fish. I am ultra-sensitive to even the slightest hint of fishy taste. I was raised in a rural area in a state land locked by at least two states on all four sides, and I claim this as my excuse for why I am able to taste even the slightest suggestion of less-than-fresh flavor in all types of seafood. The only downside to fresh, wild, and delicious fish in this iconic spot is the pricetag. When my bill for my sandwich without sides and a can of ginger ale arrived I owed $20! High, but totally worth the halibut encounter I’d just experienced. This excursion to Market Grill was a great way to restart my ritual of Pike Place Market Thursdays, and taking advantage- for the season I call a tiny apartment in the downtown of Seattle’s bustling metropolis home- to explore and enjoy all the unique and excellent spots Pike Place hides within it’s tiled floors and cobbled streets. 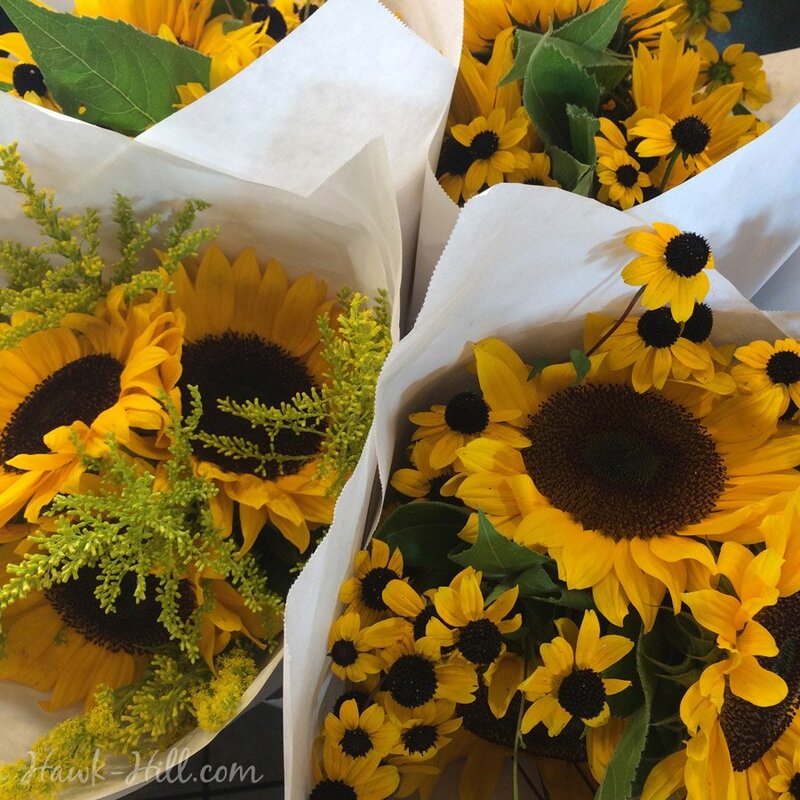 I headed home with a bouquet of Sunflowers and Black Eyed Susans, Fresh local pears, and a great new spot to recommend to friends and visitors to Seattle- I’ve already taken a friend back to visit Market Grill. With a Sandwich split between us, and a bag of chips and fancy sodas from Pear Delicatessen, this made a cheap and satisfying lunch in the market that fit a student’s budget.